Adept in psychology, he is also a master of coercion, deceit and manipulation, being able to persuade almost anybody to do his dirty work for him, even to the point where his agents are under the illusion that they are not actually committing evil or immoral acts. This has however on occasion been hinted to be a result of mind control by the use of telepathy on the part of The Brain. It was through these vast cerebral abilities that The Brain was able to unite various villains under his leadership, and form the Brotherhood of Evil. 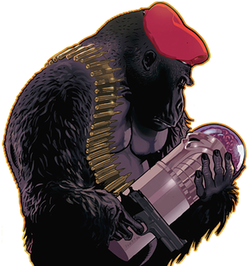 Although others often act as brawn to his brain, most notably his assistant–partner Monsieur Mallah, The Brain has occasionally used agile robotic bodies to give him mobility. The different contraptions which have been seen to hold his brain were designed by The Brain himself (also a master in biology and robotics) and have proved time and time again to be durable and even nigh-indestructible. On the rare occasion when The Brain has been caught vulnerable without robotic protection or assistance from other villains, he has protected himself by attacking opponents through telekinesis. Except for the times when he has possessed robot bodies as mentioned above, the Brain is normally portrayed as an ordinary human brain, albeit housed within what could be described as a life-sized chess piece which contains the equipment required to keep him alive; it is this portrayal that was adapted in the animated versions of the Brain as mentioned in this article. In the original Doom Patrol series, he was regularly portrayed as a disembodied brain, bobbing inside a sealed dome filled with a nutrient bath, hooked up with numerous machines, including a loudspeaker to convey his voice. In Earth-S the Brain is a man named Warden Loomis and in the Earth-Two there are two unnamed Brain's.